Hutch / Cupboard tops are designed to be placed above our (WT) work tables or our (B48 or B54) base units. 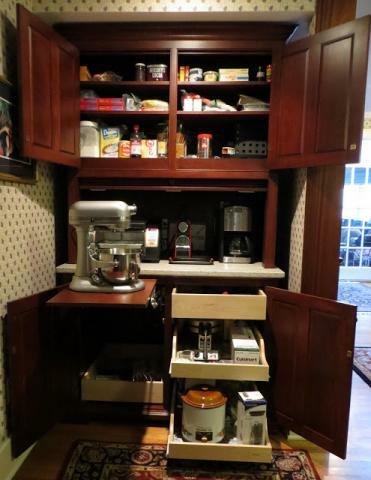 They virtually eliminate the need for wall hung cabinetry. This English style Work table / Hutch in Natural Cherry features our standard grid/glass doors. The shelf above the lower tier of drawers can store large items that do not fit into drawers, or it can simply be used for decorative accents. This table was designed for the K/BIS 2001 Design Idea Center and was located in the laundry / pantry directly adjacent to the kitchen. It’s counter space was useful as laundry sorting space as well as additional prep space for the kitchen. 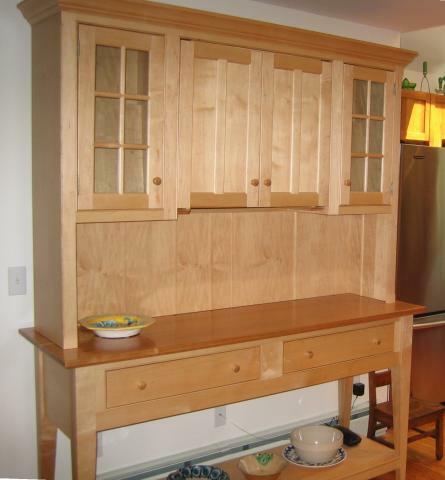 This custom CB Natural Maple Hutch above a WT-A (one shelf on the bottom) Work Table conceals a large, plug-in microwave behind the center doors. The wall behind was deepened to make room for the oven. 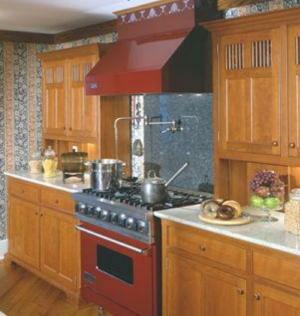 Countertop is Natural Cherry. Left, this CB48 above a B48 was added in place of an under-used built-in desk area in an existing oak kitchen. 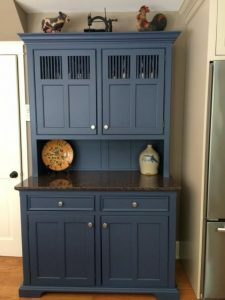 The accent piece was painted in a custom color to complement nearby antique furnishings and is used as a dry bar but it also contains the kitchen’s pull-out garbage container. 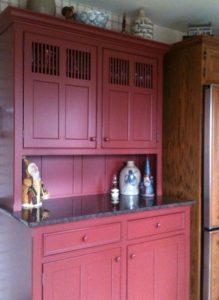 Right, years later, the entire kitchen was modernized, all the built-in cabinets were trashed, but the hutch was simply re-painted to complement the new color scheme. 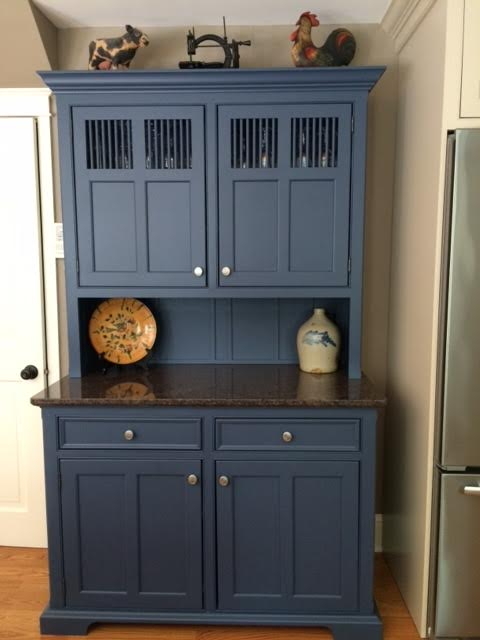 Here two CB48 Hutch tops and B48 Bases flank a commercial style range, preserving the look of furniture in this 9 piece unfitted kitchen design. This Custom TP48 hutch top has a tambour door that slides down to enclose the items on the countertop.